Preparing for the Greater Community book will be available online and in print in 2019. Be the first to know when the book is released by signing up for our email newsletter. Prior to release, several chapters of Preparing for the Greater Community are available to the world. It will take some time before people can become used to this idea of the Greater Community. It represents such a great threshold, such an enormous turning point for humanity. Some people will move towards it; some will move away from it; some will move against it. These are the three possible responses that any person can have to new ideas and to new experience. Within each of these three possible responses, there are several different manifestations. Let us take a look now and see what each of these means, and where these responses come from within the person and within human society itself. The first response to the Greater Community would be to go away from it. Human beings have a remarkable tendency to engage in denial—denying things that are ever present, denying things that are critical problems in the world, denying things that are chronic difficulties, acting like they are not there or pretending that they are in control of something when actually they are not at all. Because the Greater Community represents a tremendous change in perception and understanding, because the Greater Community will require such a tremendous change in perception and understanding, there will be a great deal of denial. Many people will simply not want to think of it at all. And though the evidence is growing every day that there is a great deal of visitation going on in the world and that many of these visitors are interfering in human affairs, people act like nothing is happening at all. They will go about their own business, preoccupied with their own personal affairs. They simply will not allow this to come into their consciousness. This kind of denial is endemic in the world. People do not want to know. Why is this? Where does this come from? Why does this tendency exist in people to such a great extent? Within the human nature, there are protections against pain, and there is a certain necessity that people be able to gain some kind of sense of control over their affairs. This produces a stability for the individual. This keeps the individual’s motivation to live and to be productive in a functional state. And yet the very mechanism that protects and preserves individuals also works against them, for it can deny the very circumstances and the very events that threaten people’s well-being and that would undermine their real ability to exert control over their lives. When you read human history, you see the evidence that people were in tremendous denial at times of challenge or change. They acted like nothing was happening, or if they had to admit that something was happening, that they were in fact in charge of it and it would work out fine. In some cases, they would appeal to a greater power, saying, “God is in charge of this,” and “God will take care of it,” and “God will produce a happy outcome.” Yet this attempt to preserve their sense of well-being actually put them in jeopardy. It actually made them more vulnerable to harm within the world. Therefore, within each person there is a certain protective mechanism that does not allow them to experience too much pain or too much uncertainty. And yet this is the very mechanism that endangers humanity and prevents it from solving its problems while the problems are small. It is in a sense the very mechanism that makes life more difficult and more hazardous. Yet denial is not simply the result of a built-in survival mechanism. It is also the result of people’s preoccupations. It is also the result of what they have given their allegiance to. Let Us explain this. If you give your allegiance to your ideas and to your preferences, then by the very nature of your approach, you are at variance with the realities of life. You are insisting that life give you what you want, and you will either deny or neglect that which proves that your emphasis is incorrect. This preoccupation with happiness, this preoccupation with allegiance to one’s ideas and beliefs, is a very hazardous approach. It sets out only to acknowledge and to identify with certain elements of life, certain aspects of life, and seeks to thwart everything else. For example, [people want] to become wealthy, comfortable and happy, but they do not recognize the course that this is producing for them—the loss of vitality, the loss of relationship, the loss of their inner life. They also do not want to take into consideration that perhaps this is not the best thing for them or for the world. They have set their minds upon one goal, and they will not consider the costs. They will not consider what this really means, and they will pursue their goal relentlessly, not realizing that it is costing them everything and that in fact it may not be meant for them at all. The idea of Knowledge is fearful to them. The idea that there are grave problems in the world is something they do not want to have to contend with. They are preoccupied with themselves and with their own goals, yet as a result they will not find their true Self, their true purpose and their true meaning in life. And they will not recognize the very circumstances of life that will determine the outcome of their existence and the future of humanity. This is fundamentally taking a position without intelligence. 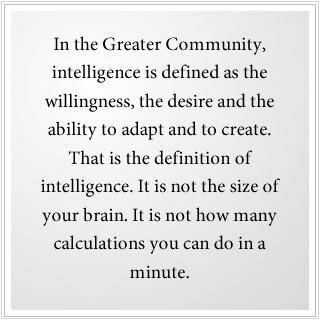 In the Greater Community, intelligence is defined as the willingness, the desire and the ability to adapt and to create. That is the definition of intelligence. It is not the size of your brain. It is not how many calculations you can do in a minute. It is the desire, the willingness and the ability to adapt and to create. You cannot create if you cannot adapt though many people attempt to do this every day. The real creative impulse comes from a direct engagement with the world, having to create something needed in the world, something that you are endowed to create, something that you have the skills to produce. This is intelligence. Intelligence is the ability to recognize a problem and to immediately address it. There is no other real and meaningful definition of intelligence. The demonstration of intelligence is the ability to solve problems in a creative way and to improve the condition of existence both for yourself and for others as a result. And yet denial, in all of its forms and manifestations, demonstrates a profound lack of intelligence. When you avoid or resist what reality is presenting to you, you are not exercising your intelligence. 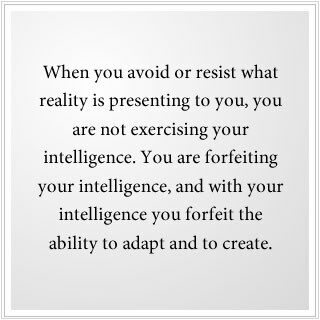 You are forfeiting your intelligence, and with your intelligence you forfeit the ability to adapt and to create. Here the pursuit of happiness becomes the root of all evil, not because it is inherently bad but because people become obsessed with it to the exclusion of everything else, and what they forfeit for their pursuit is so great and so meaningful and so important for their well-being and their fulfillment. Many people will go away from the Greater Community. They have their own ideas. They have their own objectives. They do not want life to interfere with their plans. They will simply block this from their awareness, or they will deny that it exists. Or if they cannot deny that it exists, they will turn it into something pleasurable, something good, something that they can identify with, something that supports their personal plans and objectives. This is happening in the world today. Many people think, “Oh, the visitation from other forms of intelligent life is a great spiritual event”—something that will fulfill their ideals, something that will give them the sense of enlightenment, hope and peace that they are seeking in their own lives. Yet even these goals, which in a sense represent the true purpose of life, are miscalculated and misinterpreted here. To see the real possibility for peace—developing equanimity, bringing greater harmony into the human family—you must work with reality as it really is. You cannot superimpose your ideals or your values, for life will not respond to this and you will lose touch with both your real nature within yourself and the reality of life around you. You will become estranged from life and from yourself, and the very ideals that you thought would give you the greater rewards of life will actually rob you of them. There are many people in the world today who hope and believe that the presence of the Greater Community here will bring peace and equanimity and true resolution to human life. They do not want to see the real situation. They only want to see what they want to see, and this is not seeing. They only want to think what they want to think, but this is not thinking. They are not exercising their intelligence here. They are not calling upon Knowledge within them to reveal the real truth. They are not opening their eyes to see things as they really are. This is a form of denial. This is going away from reality. This is avoiding the meaning, purpose and nature of life. Therefore, when We say that people will go away from the Greater Community, this can manifest itself in many different ways. Many will simply turn away, believing that this does not exist, and for them there will not be enough evidence in the world to convince them. Unless their lives are overtaken, they will deny and avoid the reality that the Greater Community is in the world and is casting a great influence there. Others will consider that it is a possibility, but their conclusions will only be made to reinforce their ideas and their beliefs. They do not want their world view to be threatened or challenged. They only want life to confirm it, and so they will use the evidence that the Greater Community is in the world to confirm their world view, whatever it may be. They will acknowledge that it is a reality, but they will construe it to serve their personal interests and aims. They will turn and look, but they will not see, for they will only see their thoughts and their beliefs, unable to see beyond them. This represents denial and avoidance—an inability to engage with life as it really is, an inability to open the mind and to consider something new, an inability to be vulnerable to life, an inability to begin anew in developing a new set of strengths and abilities. Many people will go away. Other people will go against the Greater Community. Unable to go away or to deny its existence, they will struggle against it. They will believe that the visitors are here to destroy them. They will believe perhaps that the visitors represent demonic forces and will attempt to interpret their presence here based upon old religious teachings in the world. In a sense, they are exercising avoidance as well because they cannot recognize that the visitors are sentient beings like themselves, driven by their own needs and preoccupations, like themselves. They will turn them into demons, into the agents of Satan. They will interpret the reality of the Greater Community from their own religious perspective, but they will not see. They will fight against the Greater Community, insisting that humanity be left alone to its own devices, but they will not understand that humanity is at a new threshold and that the presence of the Greater Community represents the evolution of life within this world. They will fight to maintain their religious ideas. They will fight to maintain their own self-identity as they know it without accepting the possibility that there is a new panorama for growth and development. They will struggle against this reality. They will see it from their own retreated position. Yet they will not understand what they are dealing with. They too will not be able to see even though they are looking. They will be governed by fear and by anxiety. The third possible response is to go towards the Greater Community, to recognize that it is a reality, to recognize that it is new, to recognize that it needs and requires a new approach and a new understanding. There will be a few people in the world who will recognize it and who will make a sincere attempt to comprehend its meaning. If they can be successful, if they can learn a Greater Community Way of Knowledge, they will be in a position to educate and to guide others and will themselves be a positive force for advancement within the world. Yet they too face great difficulties, but they must learn to see the situation with new eyes and with a new understanding. They must develop their perception and discernment. They must be able to learn about life in the Greater Community, to comprehend the meaning and the intent of the visitors. They must have the ability to see that the visitors are not angels and are not demons but are real sentient beings like themselves. They must move beyond the dichotomy of good and evil in order to see clearly and objectively. They will also have to contend with the tremendous denial that will exist and the fear and hostility that will exist all around them. Either people will not want to know or they will only see things fearfully and defensively. They will have to contend with these prevailing attitudes and beliefs, which in some ways will present even a greater obstacle than the presence of the Greater Community itself. They will have to learn to distinguish between what they believe and what they know. They will have to recognize the superstitions that exist even in their own thinking and evaluations. Their learning requirements will be enormous, yet they will have an opportunity for discovery, for creation, for adaptation, that no one else around them will have. Therefore, there are three possible responses to the Greater Community. These are the same three possible responses that one can have to any new experience in life. 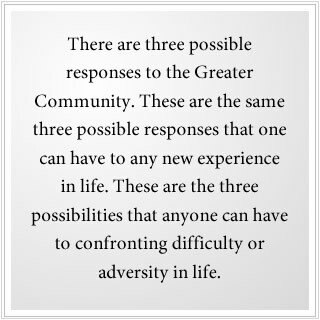 These are the three possibilities that anyone can have to confronting difficulty or adversity in life. The presence of the Greater Community represents difficulty, adversity and opportunity. Yet who is in a position to recognize this? Who can see this? Who can see things as they really are? Who has the courage to look? Who has the ability to discern the difference between reality and their own perception? Who has the patience and perseverance to learn a Greater Community Way of Knowledge? There are very powerful forces in the world that keep humanity in a state of ignorance. In some cases, they attempt to do this as their intention. In other cases, they do this inadvertently because they are ignorant. Governments within the world attempt to keep their populations obedient and compliant. This is done intentionally. They believe it is up to them to solve the great threshold problems and that the average person is not equipped or able to do this. They give themselves the sole authority and responsibility to solve the great problems of humanity. But without the will of the population, how can they do this? They do not believe in Knowledge. They only believe in persuasion and manipulation. The religious institutions in the world today want to preserve their ancient beliefs. They want to preserve their authority. They want to preserve a traditional interpretation of divinity and human purpose and destiny. For them, the Greater Community represents such a challenge and such a threat that they are more prone to be in denial of it completely. And if they do become aware of it and are able to interpret it wisely, will they have the courage and integrity to educate people, to educate their followers and their congregations? These are very serious questions. The answer to them can be found by looking inside yourself, at your own tendencies, at your own beliefs. All of the tendencies that I have spoken of so far exist within you because you have been in denial about things in your life in the past. You have struggled against change and adversity. And, at times, you have gone towards something that was new and that required a new approach. You who are reading this book have demonstrated all three of these possible responses. Even as you read this book, even as you face the challenge and the opportunity that We are presenting here, you can feel these tendencies within yourself. It is all there. And you most certainly will see them all around you in the people that you know and in the tenor, and emphasis and priorities of the public. Read your newspapers. You will see where human priorities exist. People are fascinated by murder and mayhem but do not want to contend with the greater events that are happening in life. They do not want to face the fact that the food supply in the world is diminishing, that topsoil is diminishing, that environmental systems are breaking down, that increasingly there is less opportunity in life and greater adversity. They do not even want to recognize the possibility that the Greater Community is in the world. Perhaps they will think, “Well, we don’t need one more problem like this!” There is a fundamental inability here to see life as it really is and to differentiate between what is a small problem and what is a great problem. This inability is supported by the powerful institutions in the world today. It is only because of the courageous acts of individuals and small groups that humanity has any hope of keeping pace with its changing circumstances. There needs to be more of these individuals. [This] cannot simply be the responsibility of one or two gifted people here and there. The need for education must be felt within each person. You cannot rely upon your institutions alone, for they may be unwilling or unable to provide the greater education that you need. It is your responsibility. It is your response. If you turn away from the future, it will overtake you. If you fight the future, it will defeat you. Yet if you can move towards the future and prepare yourself for the future, then you will be equipped not only to deal with it directly, but to use it to produce beneficial results for yourself and for others. This is what is necessary now. Within you, you have a great nature and you have a weak nature. Your great nature is represented by the reality of Knowledge within you. Your weak nature is your tendency to attempt to live without Knowledge and to rely upon your own ideas and preferences to guide you. Here you must choose, not only once but again and again, to find and to claim your greater nature and to receive the greater power and responsibility that this gives to you. If you seek to escape and go live in a world of fantasy, giving all of your attention to your relationships, to your hobbies or to your personal goals, you will not be in a position to contribute to life, and life will seem to be a great adversity to you. If you struggle against change and new revelations, you will be struggling against yourself, for Knowledge within you seeks to move you forward into the future by enabling you to engage with the present in a real and productive way. Yet if you hold to your ideas, if you cling to your beliefs and associations, you will not be able to respond to Knowledge. Life to you will become like a battleground, and happiness, peace and equanimity will be unknown to you. There is another problem. That is the problem of influence. This is the problem of humanity’s lack of skill and awareness of the mental environment. Today the Greater Community presences are attempting to establish themselves in the world. They are here to gain resources from the world. They are attempting to cast influence over human thinking. Part of their agenda is to take the brightest and most freethinking individuals, those who are perhaps the least traditional or conventional in their approach, and to pacify them. Here We see, for instance, a spiritual emphasis on peace and harmony and retreat from life. And yet this is not a retreat to the monastery or the convent where real spiritual focus and activity are carried out. Rather, it is more like a retreat from life itself. There is some spiritual teaching in the world today [that] does not have a Divine source. It is the product of Greater Community intervention. It motivates people to seek happiness and comfort beyond all things, setting them into a process of retreat from life and retreat from themselves. While these teachings promise enlightenment, unbounded happiness, equanimity and uninterrupted joyfulness, they in fact neutralize the deeper inclinations of the people who are affected and put them into a position where they cannot see, they cannot know and they cannot act according to Knowledge. Their desires, their preferences, their hopes are so indulged that they cannot see or know anything else. It is a remarkable thing that with the world becoming ever more demanding, calling for resolution, calling for positive engagement, calling for contribution, that so many people who are in a position to provide these things are becoming pacified and disabled. They retreat to their little hamlets in the mountains or on the beach. They go away from everyone and everything that they find to be distasteful. They seek to isolate themselves and insulate themselves in a world without tribulation, in a world without difficulty. And yet they wonder why there is such tribulation within themselves. Perhaps they are taught that it is part of their spiritual unfolding when in reality it is the conflict that they are experiencing that is the result of the inability to engage with life within themselves or life within the world. They suffer, but their suffering is justified. They want to surrender their power to a greater power, but they do not have the wisdom or discernment to know who to surrender themselves to or what this really means. So they give it all away to be guided, but they do not know who is guiding them. They want to be free of responsibilities of life. They want someone else to make the decisions for them. They think that being like little children, carried along, led along by the hand, is the way to live life and to be genuine within life. They forfeit their authority. They lose connection with their soul, all the while believing that they are living a truly spiritual life. They are not in a position to face the Greater Community. They are not in a position to understand the Greater Community. They are not in a position to use their own authority to call upon their own strength, to set aside their preferences, to risk their happiness, to do something vital and necessary in life. They have lost the will to engage with life. They have given over their authority. I can assure you that the Creator does not will this. This is not the way. The focus of the Creator and the Unseen Ones is to make people strong, responsible and capable. It is not to generate some kind of spiritual welfare where people hope and expect that everything will be provided for them. I can assure you that the Greater Community forces who are interacting with humanity will take full advantage of these tendencies and will use them for their own benefit. They will study these individuals. They will neutralize their deeper tendencies. They will take advantage of their naiveté. And they will direct their good intentions. Perhaps at this point you are thinking, “My God! Is this possible? How can this be?” But when you gain skill and understanding of the mental environment, you will see what an opportunity this creates for the visitors and how relatively easy it is for them to take advantage of it. Do not trust any spiritual teaching that does not emphasize your authority, that does not emphasize the reclamation of Knowledge within you, that does not call you into the world to respond and to act, to contribute, to learn and to give. Do not respond to any spiritual teaching that robs you of your responsibility to do this and that does not cultivate genuine and practical wisdom within you. This you must discern for yourself if you are going to be amongst those courageous individuals who will choose to face life and to engage with life, who will choose to become strong in The Way of Knowledge and who will choose to develop wisdom. As We have said, it is the tendencies of humanity rather than the intentions of the visitors that will be the most difficult and discouraging things to deal with. For there is a preparation to learn how to interpret, contend with and relate to the Greater Community presences in the world. They are not all powerful. They are not omnipotent. They are relying upon human weakness to establish themselves. But where human strength can emerge, they will find that humanity will be more than a match, and they will have to adjust their agenda, and they will have to change their approach, and they will have to learn to respect the rights, privileges and dominion of human existence. Yet you must earn their respect. You must demonstrate your abilities. You must establish your boundaries. You must gain your discernment. You must exercise your authority. Even if you are the only person you know who is doing this, you must do this. Look to life. Become a student of Knowledge. Let the greater power emerge within you. It will revitalize you. It will give you courage and strength and perseverance. It will lift you above demoralization and discouragement. It will give you the Light of life. It will give you what the Creator wants you to have, and it will enable you to do what the Creator wants you to do. It will enable you to rise above the fog of human denial, human ambivalence and human hostility. It will take you out of the realm of belief into the realm of certainty, wisdom and strength.